Each Monday you will be given your list words to learn for the week. Every Friday you will be tested on these words. Use the following websites to help you practice and learn your words, spelling patterns and rules. oh great, not more spelling! 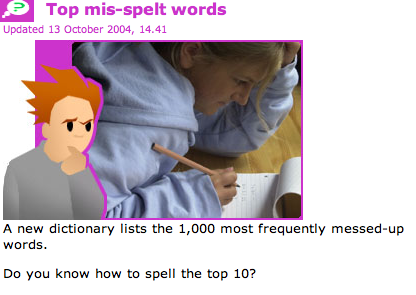 I got 10 out of 10 in the 10 most misspelled words! I like spelling, it's my favourite subject!!!! !